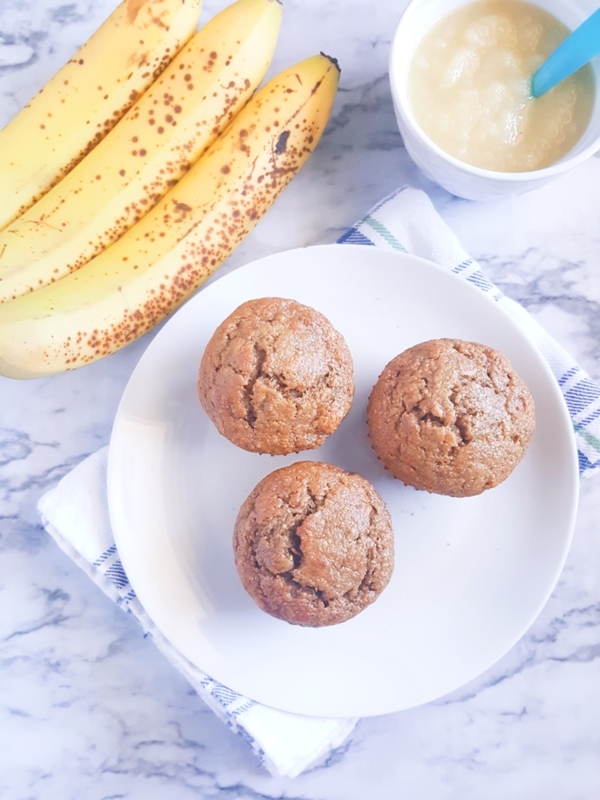 These healthy banana applesauce muffins are made with whole wheat flour and are oil free, butter free, and dairy-free! This recipe calls for simple ingredients and is so easy to put together. These muffins are low in fat and high in fiber making them a perfect breakfast or snack option for kids and toddlers. I’ve come to realize that a lot of muffins are just breakfast cupcakes. That really is what they are. Now, let me be clear; in no way am I going to stop eating these breakfast cupcakes, but you gotta have some balance in your life. It’s time to cut back on the junk food breakfasts. Don’t deny it. Sometimes you have breakfast foods that aren’t really breakfast food because it’s easier to just throw some high corn syrup O’s cereal in a bowl with some milk and eat it. We all do this. I’m guilty of it too but we can’t go on like this. 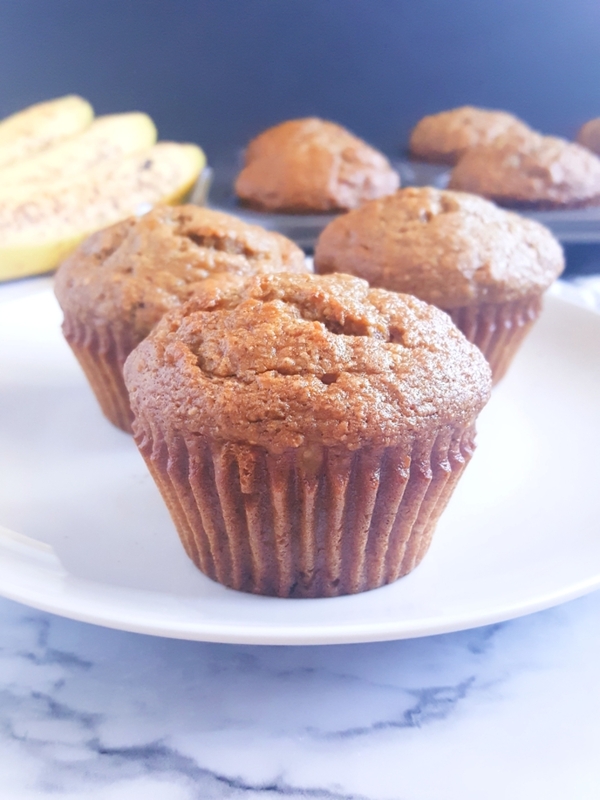 So for those of you who love banana muffins with all your heart but are trying to stay on track, I have a much healthier option for you. These low fat muffins are also a healthier breakfast option. They’re made with greek yogurt instead of oil or butter and studded with chocolate chips! I’m always looking for ways to “healthify” baked goods because I bake a lot and I always eat what I bake. It never goes to waste. A few years back I remember reading somewhere that you can replace oil or butter with applesauce and I was like yea right. I was so skeptical. I thought that it would make baked goods have a weird taste or flavor but eventually I gave it a try and wow. I’m really glad I did because I almost always have applesauce on hand and so I use it as a substitute when I feel like I need to cut back on the calories. I’ve learned that making little changes can really have a big impact on your overall health. Healthy, Whole Wheat, and Dairy-Free. 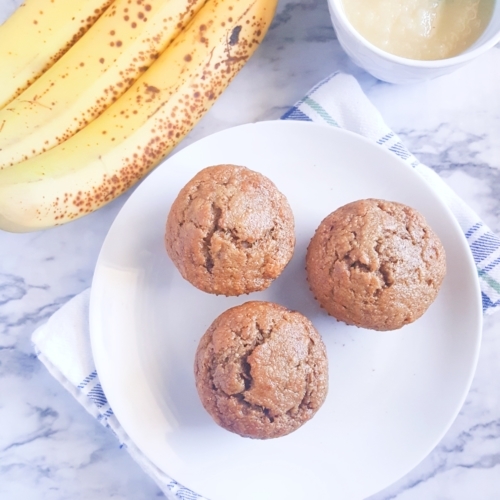 These Banana Applesauce Muffins are made with whole wheat flour, they’re lightly sweetened, and dairy-free! But don’t think that just because they’re healthy means that they must taste like damp sawdust. Oh no, quite the contrary. They’re just as comforting as your good ole buttered up, overly-sweetened banana muffins. And you’re probably assuming that if they don’t have butter well they definitely must have oil. Nope! No oil either. These banana muffins are made with applesauce instead of oil or butter. These low fat banana muffins are also high in fiber. These muffins make for a kid-friendly breakfast. They’re great for the lunchbox too. In addition to all that other great stuff this is such a simple muffin recipe and it’s extremely easy to make and it all in one bowl too. It comes together in just ten minutes. I really like whole wheat muffins but only if they don’t taste like whole wheat muffins. You get what I’m saying? I don’t like how sometimes they can have this harsh texture or be extremely dry. These two reasons alone made me avoid whole wheat baked goods for years. Fortunately, that’s not the case with these muffins! Even the pickiest of eaters will approve. If you’re making the switch to whole wheat flour start with these! You’ll know the difference but it’s a good difference. These are so much more filling compared to white flour muffins. I tried to keep the sugar amount as low as possible but still enough so that the muffins are tasty and it worked out perfectly. 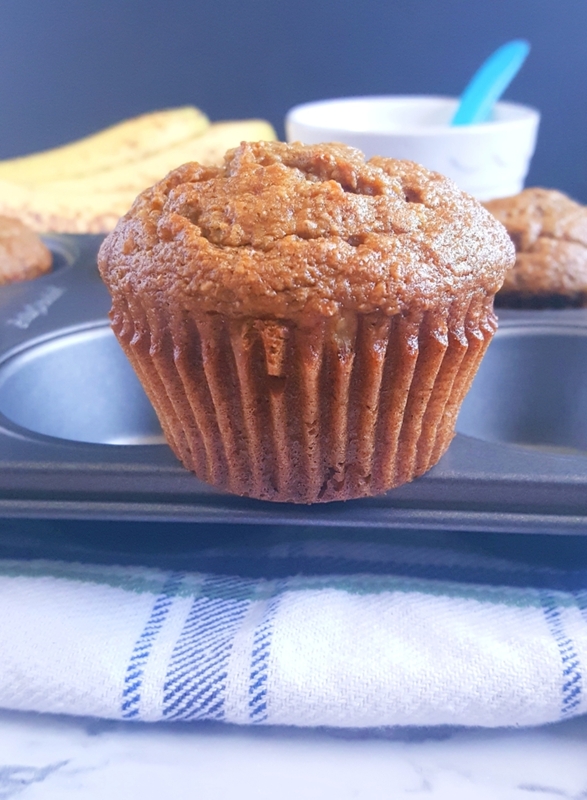 And of course I had to use brown sugar in these muffins because I love to use brown sugar in baked goods and also for flavor, but if you’d rather a healthier option go right ahead! One reader commented on this Pinterest pin saying that they used coconut sugar. Perfect for Kids and Toddlers! Since becoming a mom I’ve learned many things, but there’s one thing that I’ve been learning over and over again. Kids like things simple and that’s what these muffins are—simple. My kids love these muffins. They gobble them up. They don’t even realize that they’re healthy or whole wheat for that matter and they’re picky eaters. I swear they like these more than the fancy muffins I try to kill myself making. I remember this one time I bought this ridiculously expensive, fancy toy for my son when he was one and a half. I took the toy out and he played with it for about 5 minutes then he got bored of it. He looked up at me then looked around the room. I thought he was just going to grab another toy to play with, but no. All of a sudden his face lit up. He ran across the room and threw himself on top of the box. What box you ask? The box that the toy came in… He had more fun playing with the stupid cardboard box than he did with the toy that cost mommy a lot of money. Moral of the story; don’t try fancying it up. Kids like simplicity so save your time (and money) by keeping it plain and simple! And let’s be honest, many of these ‘muffins for toddlers’ recipes aren’t really all that healthy but these are. You don’t have to feel bad about giving these to your child and I promise you that they will actually eat them because this recipe is tried and true. These apple and banana muffins for toddlers and kids are great for adults too. I love recipes with bananas and applesauce because they always turn out so soft and moist. If you didn’t know this already I’m gonna tell you today; any kind of baked good with banana and applesauce combined is going to be super moist. So you won’t miss the butter in these muffins at all. Just please make sure that your bananas are overripe. This is the key to insuring that the muffins stay moist. Overripe bananas = moist muffins. The recipe that I started out with for these muffins called for milk but I omitted that and I’m really glad I did because that stretched the batter too much. It made the muffins too “watered down”. Also, I decided to add some baking powder and bake them at a higher temperature because they kept coming out flat and I hate flat muffins. I like muffins with a nice big top. 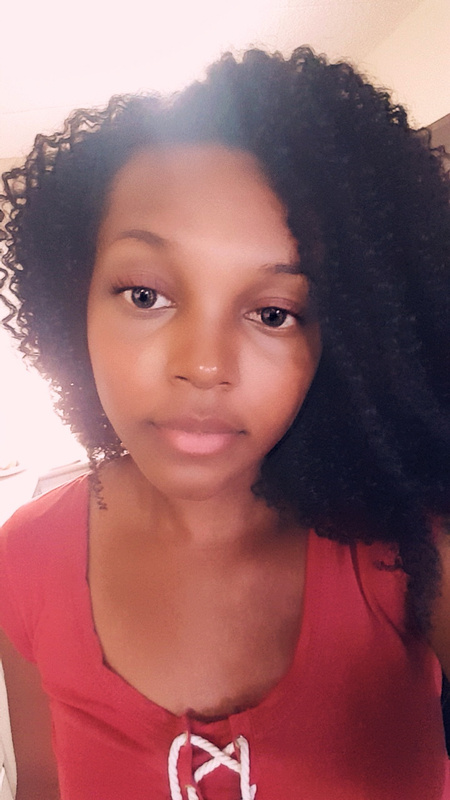 They’re not the biggest but at least they’re not flat and that’s all I want. The smell of these muffins is so intoxicating. Apple and banana is a great flavor combination. When I pulled them out of the oven I took a big whiff. They smelled so good! The fragrance of the applesauce really shines through. Don’t wait until they’re fully cooled to sink your teeth in. They’re best served warm. Like, fresh from the oven. I know this is true for all muffins but it’s especially true for these. If you don’t plan on eating all twelve muffins right away make sure you store them in an air tight container. They should keep for up to three days. I like to just keep them in the muffin pan and cover them tightly with foil, especially when it’s summer time because the fruit flies go crazy for these. I warm them up in the microwave for a few seconds the next day and they taste just as great as they did the day before. You’d never be able to tell that these are no oil banana muffins without knowing this beforehand. The applesauce does the job perfectly. And I love that these muffins aren’t dense. They’re just soft all around. Not only are these muffins great for breakfast they’re a healthier snack option too. They keep you full in between meals and help you avoid snacking on things that don’t really hold much nutritional value. I think I’m in love with banana baked goods. I plan on posting more healthy banana recipes in the future. I had to add a little cinnamon to these because it goes so well with both apples and bananas. It would have been a crime not to. It compliments them so well and gives these muffins a comforting smell and taste. Maybe add a pinch of nutmeg if you want to. If you only have sweetened applesauce on hand just cut back on the sugar. I’d say use 6 tablespoons of sugar. That should do the trick. 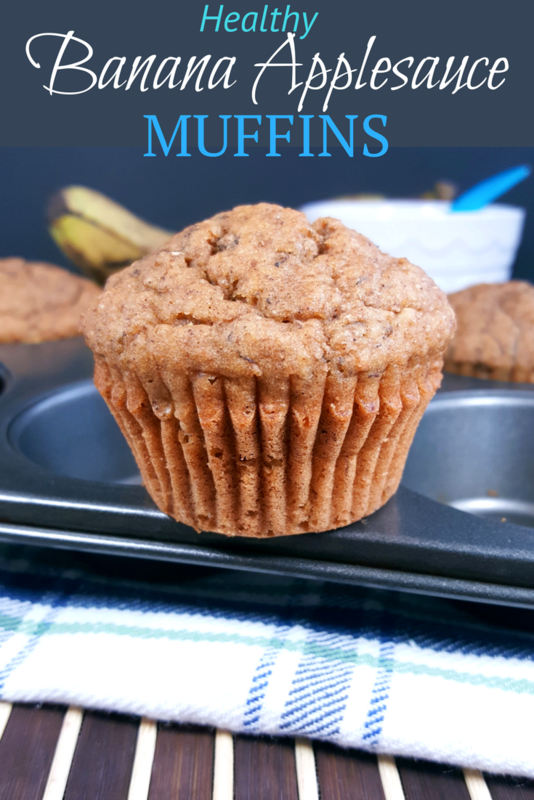 These muffins are so easy to make and they always turn out soft, moist, and delicious just like these Healthy Greek Yogurt Chocolate Chip Banana Muffins. In a large bowl combine bananas, applesauce, sugar, cinnamon, and salt. Add flour, baking soda, baking powder and gently fold until combined. Scoop batter into the muffin pan filling the cups 3/4 full. Cool in pan for 10 minutes. Serve warm. Can you omit the egg and add extra applesauce? My son is allergic to eggs. Hmm, I’ve never tried it before but if I were to do it I’d replace both eggs with 1/2 cup applesauce and increase the baking powder to 1 teaspoon. Eggs are actually not dairy! They’re often times grouped with dairy products but dairy is milk and food products made from milk. Eggs fall into the ‘animal product’ category. I don’t have any whole wheat flour in the house. Can I use the same amount of white flour?